Harrogate Theatre's Young Reviewers scheme -Hannah Draper, Harrogate Theatre's head of education with Graham Chalmers of the Harrogate Advertiser, student reviewers and Hannah Hancock (King James's High School, Knaresborough). 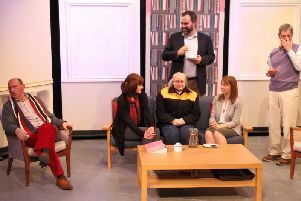 The latest team of would-be reviewers from secondary schools in the Harrogate district showed some real talent in their journalistic assignment at Harrogate Theatre. Their mission, set by the theatre’s education and workshop leader Hannah Draper in the Young Reviewers Scheme with the Harrogate Advertiser Series, was to write their own review of this year’s pantomime at the theatre. What follows is a review of Cinderella by Hannah Hancock, a student at King James’s School in Knaresborough. “To all those who preach that pantomimes are dated and ludicrous, there is just one thing to say: OH NO THEY’RE NOT! Nothing beats a classic panto at Christmas and this year Harrogate Theatre is back in full swing to prove it. Director Phil Lowe remixes Cinderella, the classic rags-to-riches tale, into a modern mash-up of our favourite pop songs, local references, and – of course – many, many puns. From the Brownies in the front row to the gaggles of grandparents in the back, not a soul will leave the building without a grin on their face. Throughout all the mischief of Cinders’ evil stepmother and ugly (to put it kindly) stepsisters, through the aid of her fairy godmother, and the love-stricken Prince Charming, there is one character who ties the whole thing together. Tim Stedman joins Harrogate Theatre for his 15th year, this time as Buttons, and does not fail to please. With wacky physicality and perfect comic timing, Stedman’s side-splitting performance steals the limelight, scene after scene. That’s not to say the rest of the cast isn’t packed full of talent, however. Cinderella (Lucy Jane Quinlan) lives up to her magical reputation with her endearing delivery and songs that melt hearts. Prince Charming (Colin Kiyani) also shows off some impressive vocals skills and together the pair create an adorable, pitch perfect couple. The other duo in the spotlight are the Ugly Sisters (Philip Stewart, David Westbrook) whose easy banter creates humour whenever they’re on stage.